Piazza del Gesù is one of the most important squares of the historic centre of Naples and one of the landmarks of the entire city. It is a square situated along the “decumano inferior”, a street known also as “Spaccanapoli” because it literally divides the centre of the city in 2 halves. 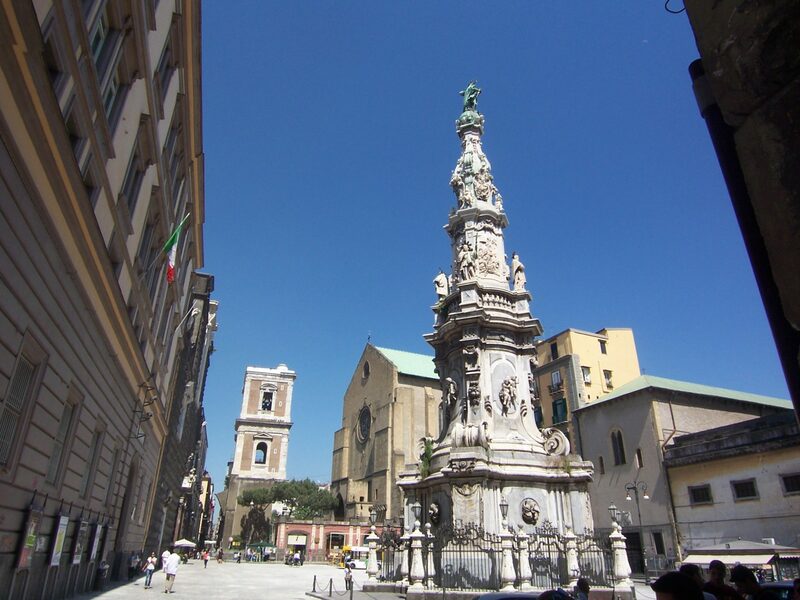 After walking on via San BiagiodeiLibrai and Via Benedetto Croce, you arrive in Piazza del Gesù, a large space full of monuments and churches to visit, each of one has a specific role and its own story. Piazza del Gesù and its attractions are also venues for a lot of cultural events such as exhibitions and concerts. The square was commissioned by King Charles of Anjou. The name of the square is due to the presence of the Gesù Nuovo (i.e. New Jesus), a palace that became the church of Gesù Nuovo. The material that covers the façade has a mysterious legend: it can be translated into a musical score. The centre of the square is characterized by the obelisk full of sculptural details which figures hide secrets about death and post mortem life. In the immediate vicinity of Piazza del Gesù there is the monastery of Santa Chiara, with its famous cloister and its tower. You can recognize the green roof of Santa Chiara from almost every point of the city, even from the sea! The church of Santa Chiara is the largest gothic basilica in the city. Built in the 14th century, it stands on the ruins of ancient Roman baths. Starting from Piazza del Gesù you can visit two marvellous buildings in which one of the most important Italian philosophers of all times lived: Benedetto Croce. Palazzo Filomarino was his residence. Part of the seventeenth-century building – such as the library – is still dedicated to him. Palazzo Filomarino hosts the Institute of historical studies founded by Croce. The Italian philosopher used to walk in the gardens of Palazzo Venezia, a building that now hosts art exhibitions and classical music concerts. The palace owes its name to its use in the past: the place used to be a residence of the generals of the Republic of Venice and both a symbol of the happy relationship between Venice and the Kingdom of Naples. After visiting Piazza del Gesù and all its attractions you can go in Piazza Dante and via Toledo or Piazza San Domenico and Via Duomo.